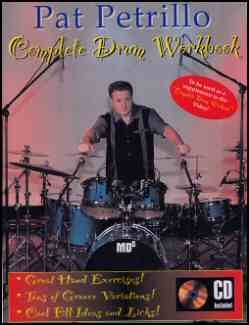 In view of the fact that Pat Petrillo can be considered a 'complete' drummer, having worked in various musical fields including jazz, pop, R&B, and Broadway shows, it's not surprising that he has released a video titled Complete Drum Workout and a companion book Complete Drum Workbook. After catching Pat's Drum Clinic (see the sidebar), I was interested to see what Pat would include in his series. Because the book (which includes an audio CD) contains the same material as the video, I review them together. The book opens with a chart showing the beginning reader how to execute each of the 16th note patterns used in the exercises and grooves. Pat then includes his favorite 15 Hand Exercises that cover various techniques from his version of Full Strokes to his Whip/Drop to Ghost Note studies and exercises utilizing rudiments including Paradiddles, Ratamacues, Drags, Triplet Rolls, Open Roll development, and Flams. Each exercise includes both a starting metronome marking and a maximum "goal" tempo so you can judge your progress. If you're a beginner, you'll especially benefit from having the video as well as the book. This will allow you to see exactly how Pat executes each technique. This section includes 8 basic groove variations for you to combine and play against 10 bass drum rhythmic pattems to create lots of variations. The book includes an audio CD that contains slower tempo versions of these exercises than the video so you can practice in various tempos. (Pat also recommends that you buy an inexpensive Karoake machine so you vary the speed of the audio CD for further practice). 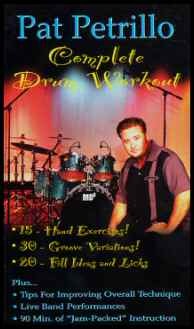 Pat designed the exercises in this section to give you the ability to color the groove in a way similar to drumming greats Clyde Stubblefield, Zig Modeliste, David Garibaldi, Steve Gadd, and others. Also included are 'beat displaced" grooves to help you develop the ability to shift the feel away from 2 and 4 on the snare drum creating more interesting patterns. Pat's take on fills is that the drummer should learn both simple and complex types while keeping them musical at all times. And in keeping with that philosophy, Pat includes both simple and advanced fills in this, his final section. Included are fills using rudiments and Advanced Sextuplet fills similar to those used by Steve Gadd. I found a few relatively minor flaws in the video and supplemental book that consisted of some of the exercises in the book not being played exactly the same on the video and one mislabeled drum fill on the video. Also, in view of the fact that the video is only 90-minutes long and the book contains only 28 pages, I would have opted for a title such as Pat Petrillo's Drum Workout as opposed to 'Complete' Drum Workout as a more accurate description of the contents. However, none of the above detracts from the overall usefulness of the material, which is extremely practical stuff that any working drummer can use on a daily basis. Beginners and intermediate players would benefit most from the purchase of both the book and video, while experienced players should do just fine with the book/audio CD alone.